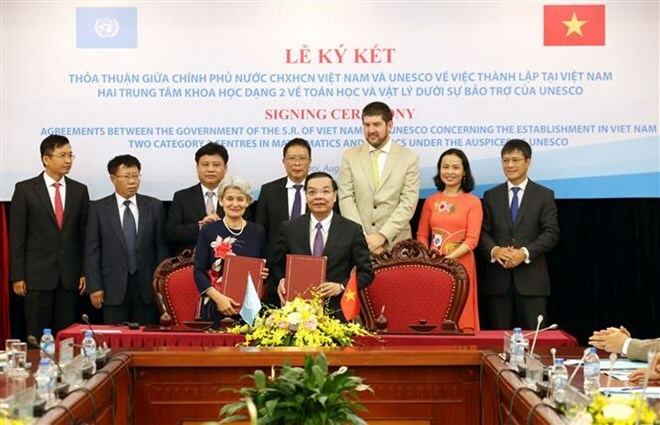 Hanoi (VNA) – Vietnam’s Ministry of Science and Technology and the United Nations Educational, Scientific and Cultural Organisation (UNESCO) on August 24 signed an agreement to establish two category 2 centres for mathematics and physics. They are postgraduate education centres for mathematics and physics which will help implement basic science programmes as well as theoretical physics, said Irina Bokova, Director-General of UNESCO at the signing ceremony. She also highly valued Vietnam’s investment in education and renovation reforms, describing it as an important momentum in sustainable development, contributing to the settlement of challenges in the world such as climate change. For his part, Minister of Science and Technology Chu Ngoc Anh said with the establishment of the two mathematics and physics centres, Vietnam wants to contribute to the development of basic science within the goals set by UNESCO, while sharing and supporting regional and developing countries in these areas. The signing of the pact will not only help Vietnam boost its cooperation with member countries of the Association of Southeast Asia Nations (ASEAN) as well as developed and developing nations in the world via the UNESCO network. It will also elevate the status of Vietnam’s science while contributing to the development of basic science in the region and the world. The establishment of the two centres under the auspice of UNESCO in Vietnam is in line with the country’s science and technology development strategy for the 2011-2020 period with an aim of setting up research institutes that meet regional and global standards.